OPI Dating a Royal | Light Your Nails! Per fortuna oggi non ho sentito parlare del Blue Monday, ma solo del maltempo (comunque il lunedì è già deprimente di suo). Bello questo blu, ci vedo come una punta di "dusty" (o forse è lo schermo) che mi piace molto, sembra diverso dal solito blu brillante. Non è brillantissimo, ma anche per via della tonalità, nel senso che non è un royal blue! Love this polish! I wonder why I don't have it, I think that has to change. I am pretty happy to own it! Yesterday for me was a great day! Yeeey! Love this dark shade on you! That's good to hear Andrea! Oh what a gorgeous blue cream! Love it! Very pretty! I agree CG and OPI do seem to make really good blues! 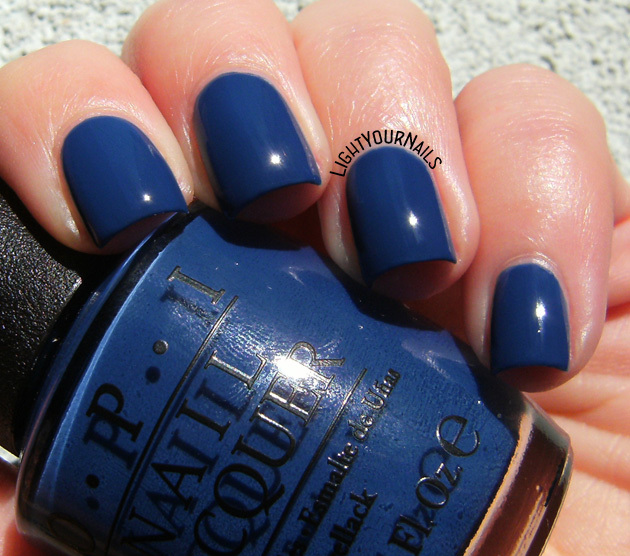 I don't think I have seen this blue shade before, but I definitely feel like I need it now. My collection is lacking in dark vamp blues. I wouldn't say this is a dark one, more of a medium tone, but really pretty nonetheless! ...è splendido questo blu...adoro il blu sulle unghie...ne ho anch'io di smalti opi blu, questo mi manca!!! OPI fa dei gran bei blu! That is a great shade of blue!! I doubled up on base coat and it didn't stain. Better safe than sorry! I always gravitate toward blues so of course I love this! You are right about these brands doing amazing blues! I have so many from them!